Cabbage is a species of flowering plants known by the scientific name Brassica oleracea. It is best known for its leafy vegetative growth that is a popular food staple around the world. This plant comes in many varieties, and can be prepared and cooked in many ways for different tastes. Most cabbages you will see are green colored, but red or purple varieties are also common. Cabbages grow best in cool, moist climates. They come in many different colors, including: white, green, red, purple, and Savory (which is a yellowish green color). Cabbage Variety Both red and purple cabbage take longer to mature, making them harder to find. Their only enemies are insects that eat away at the plant. Cabbages have been cultivated for 4000 years, although the cabbage head wasn't developed until the Middle Ages by Northern European farmers. It originated from the Celts in Asia around 600 B.C. The Celts then brought it over to Europe. In 1536, the French navigator Jacques Cartier introduced the cabbage to America. The worlds largest cabbage was gown by William Collingwood from County Durham, England in 1865, weighing in at a whopping 123 pounds! Egyptian Pharaos believed that if they devoured large quantities of cabbage the night before, they would be able to drink lots of alcoholic beverages without feeling the effects. In 1769, on Captain Cook's ship, the doctor used cabbage as compresses on wounded soldiers, which would save them from gangrene. Eating cabbage on New Year's Eve is good luck, and the green leaves of the cabbage are said to represent money. 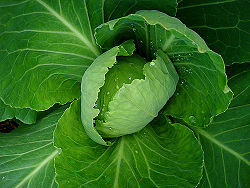 1 -The super chlorophyll contained in the cabbage is useful in strong blood building. 2 -It was found that if you drink the juice of a cabbage, it will help prevent breast, colon, liver, lung and ovarian cancer. 3 -The amino acid contained in the juice is very helpful for cleaning and healing your digestive tracts, while it detoxifies and repairs your ulcers. Only 100mL is to be taken at a time, up to three times a day, and on an empty stomach. 4 -Histidine, a compound in the cabbage, is helpful for treating allergies, and also for regulating T-cells found in your immune system. 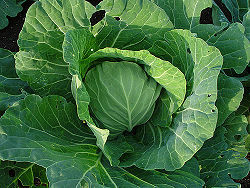 5 -There is a substance in cabbage, that, when eaten, stops the conversion of sugar and other carbohydrates into fat. This is an ideal weight loss solution because it is easy and painless! Cabbage sprouts are healthy and packed with more nutrients than the rest of the cabbage. Also, the smaller cabbages have been shown to be tastier than their larger counterparts. From the second the cabbage is cut, it starts to lose its nutrient content, and it will keep dropping unless stored in a plastic bag in a refrigerator. This page was last modified on 16 May 2016, at 01:46.